Lyndon, aka Seegold Lyndon, is a 10-year-old blue female born February 8, 2005. Her sire is Barry Lyndon and her dam is Gable Frazier. Lyndon has no races on record, instead going straight to motherhood. 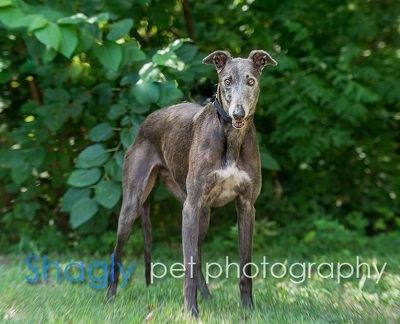 There are four litters on record at Greyhound-data.org: one in September 2008 with sire AM's Wishdoctor, one in November 2007 with sire Lonesome Cry, one in August 2011 with sire Kiowa Sweet Trey, and one in August 2013 with sire LS Jack Williams. Lyndon is sister to Jane who also recently retired from motherhood. Lyndon is not considered cat tolerant at this time. Easygoing and adaptable, Lyndon is eager to become an established, attached member of the family and pack. This seasoned brood mama boasts impeccable house manners and a bladder of steel. She does well when left alone and will often choose to nap in a dog bed in another room, although she clearly enjoys the bustle of normal household activity and keeping watch on the neighborhood through the windows. 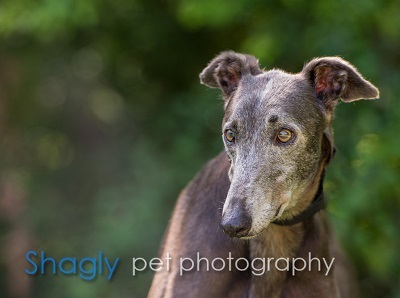 Lyndon gets along well with other greyhounds, although she is not cat- or small dog-safe. She has a strong prey drive and would adore a yard with squirrels to watch and chase. She is friendly and relaxed with visitors and is forming warm, loving relationships with family members. She does not seem comfortable around small children and prefers to retreat when they approach her closely or try to hug her. Lyndon enjoys her morning walk and walks well on a leash. She's getting better every day at navigating tile and wood floors, and she's explored halfway up the stairs a time or two. She's a cautious eater who comes running for the smell meat or fish even from the other side of the house, but she likes to ease into trying new treats and people food. Seasonal pumpkin biscuits have become a favorite, and she crunches them as efficiently as the rest of her foster pack despite having fewer teeth. Lyndon is sweet-natured, quick to learn, and eager to please. Looking for a companion who's an easy addition to your home? Lyndon's ready.